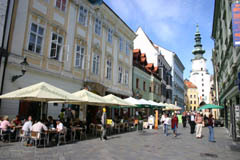 Shops of all types tend to open at about 10 a.m. in Bratislava (large retail stores open sooner), and close around 6 p.m. (large retail stores and shopping malls are open to at least 9 p.m.), Monday to Friday. Almost all shops are open on Saturday at least until lunch. Later on Saturday and all day Sunday, large retailers and shopping malls are sure to be open, other shops generally are not. Most places will accept payment by major credit card. The main exception is small neighbourhood shops, and even some of them take credit cards. Payment in EUR is always accepted, but very few businesses accept other currencies. The beautiful streets of historical Old Town Bratislava are lined mostly with shops offering the finest luxury merchandise, and priced accordingly. An adjacent section of central Bratislava, focused around Obchodna ulica, offers a very different mix of shops, mostly inexpensive. Mostly outside of Old Town but still easily reachable, Bratislava's street markets are real gems if the season is right. Apart from the malls, numerous modern shopping centres are springing up in many parts of the city, especially in new office buildings (closed on weekends) or near hypermarkets (open all weekend). These usually look like mini shopping malls, and have similar retailers, except they have only about ten or twenty shops and two or three restaurants or cafes. Most of the city’s residents do their shopping around their homes. You’ll find little shops on street corners, in old strip shopping centres, and stuck into sections of apartment blocks. Customer service and assortments are in short supply, but these shops supply the needs of most Slovaks, and a visit will give you a look at real-life Slovakia. Also, little by little western European retailers are spreading into the neighbourhoods. These self-service shops make for an easy shopping experience similar to the most modern shops in the world. Tips : what to buy in Slovakia.